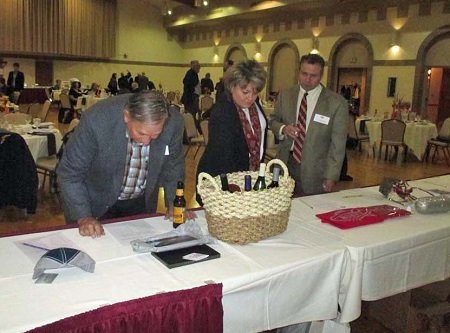 Our 62nd Annual Banquet and Silent Auction a Success! Over 70 people attended our banquet and were treated to an amazing presentation by Michael Dougherty, Goodyear’s Assistant Chief Pilot. 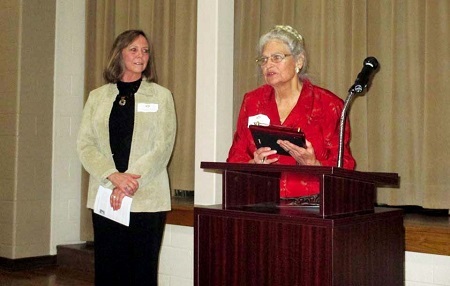 The evening included the presentation of two Lighter-Than-Air Society’s awards and a Silent Auction. 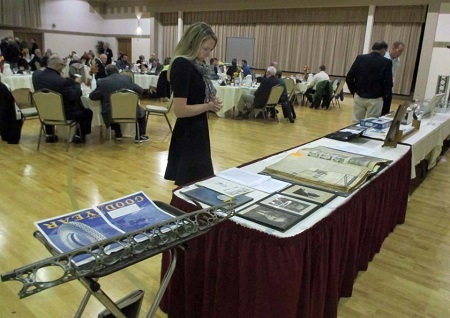 Sarah Wolf admires some of the lighter-than-air memorabilia on display at the banquet. 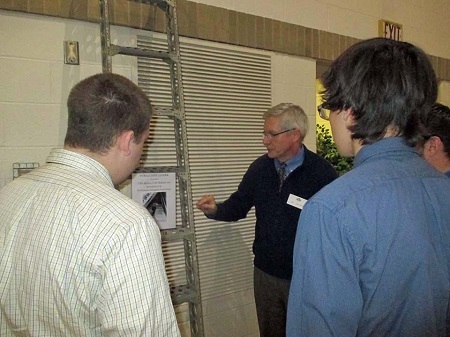 Throughout the evening, attendees had the opportunity to browse a large number of lighter-than-air memorabilia. Aside from items belonging to the Society’s collection, several members displayed items from their private collections. 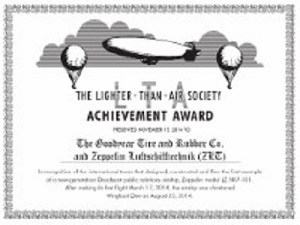 The first award presented was The Lighter-Than-Air Society Achievement Award. It was awarded to the Goodyear-Zeppelin Team that worked on designing, fabricating and assembling the new LZ N07-101. The airship that is based on the design of Zeppelin’s LZ N07-100 was modified to accommodate the needs required by Goodyear for their airships. The P. Rendall Brown Lifetime Achievement Award was presented to Joan Reisig. Joan joined The Lighter-Than-Air Society in 1965, and is a Life Member. In 1983 she went to work for Goodyear Aerospace as a design draftsperson, retiring in 1991. She then joined the Goodyear Airship Operations at Wingfoot Lake as a contractor working on the design of the GZ-22 blimp. Joan has been a member of the LTAS Board of Trustees since 1990. Joan Reisig, recipient of the P. Rendall Brown Lifetime Achievement Award recipient addresses the audience. Ren Brown’s daughter, Carol Ault (L) looks on. In his presentation Mike Dougherty talked about the design and construction of Goodyear’s new airship, a LZ N07-101 and compared it to the Goodyear GZ20’s that have been flying over the United States for many years. His presentation was followed by an animated Question & Answer session. 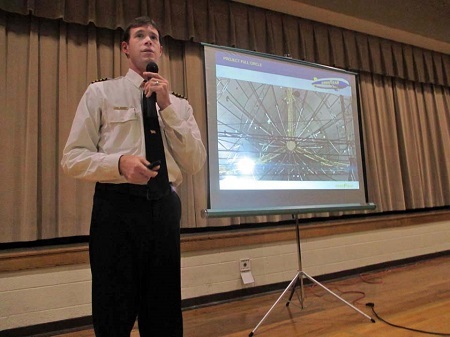 Michael Dougherty, Goodyear’s Assistant Chief Pilot during his talk about the new Goodyear airship, Wingfoot One. At the end of the evening, the results of the Silent Auction were announced – $ 3,949.00 dollars were raised. The auction items included a flight for 2 on the Goodyear blimp (courtesy of The Goodyear Tire & Rubber Co.), a guided tour of the Akron Airdock for 4 (courtesy of Lockheed Martin Corp.), a round of golf for four at the Firestone Golf Club’s South Course (courtesy of Chemstress Consultant Co.) and several lighter-than-air collectibles. . The winners proceeded to check out, bringing the evening to a close. LTAS member Ron Syroid (L) examines an auction item, while members Trey and Rachel Wackerly discuss their bid. This entry was posted in Annual Banquet, Events and tagged Airdock, Akron, blimp, Blimp NT, goodyear, New Goodyear Airship NT, Zeppelin Luftschifftechnik, ZLT. Bookmark the permalink.